I first met Susan Beal through the internet, back in the early 2000s. I sometimes miss that time–the internet was small and a whole lot of sharing went on in a seemingly private space. So much has changed since then! We met in person at a get-together in Brooklyn, and I bought a pretty necklace she made from vintage beads, and shortly followed with an order for one of the super cute purses she used to sell (you might also remember her A-line skirt kits!). When I lucked out and got my first editorial position as the Craft and Decorating Editor for the now defunct Joann magazine, I remember thinking, “Why can’t I ask my friend Susan to make us some projects [instead of xyz designer] so I can make sure they are hip and cool?” And so I did. Even though Susan was in Portland and I in NYC, she was an inspiration to me–she wrote articles for cool magazines and worked on craft and jewelry books as a freelancer; and when I was looking to leave New York, she was the one who suggested I should write a book (which turned into Crochet Adorned). Without her suggestion and support, I never would have landed that first book deal that led me down a more focused road to crochet designing. And it was Susan who invited me out to Portland on the suggestion that I could do a book signing at Powell’s. Over the years we have been able to help each other out with jobs, ideas, and support, and I treasure her friendship. 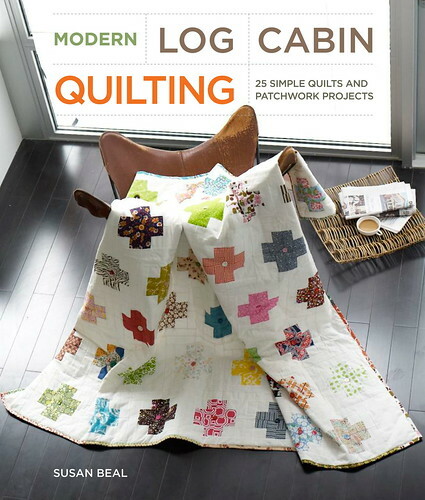 And that is why I am so excited to introduce you to Susan’s newest book, Modern Log Cabin Quilting: 25 Simple Quilts and Patchwork Projects . The book contains 25 inspiring quilts and smaller projects, all made from the improvisation-friendly log cabin block. So, if you’ve always thought about quilting but the cutting and measuring never appealed to you–Susan’s book is the perfect introduction. Each project contains detailed information about the size of each central fabric piece, along with the width for each ‘log”, allowing you to assemble the blocks as-you-go rather than fussing over straight corners and perfectly cut dimensions. Susan also includes tons of clear technical illustrations to help you visualize techniques such as chain piecing, pressing seams, and sashing–things that some quilt books assume you already know. Susan surprised and impressed me with her modern, colorful style. Each project feels distinctive in its fabric selection, and unlike many of the other “fresh” quilting books on the market, she mixes lots and lots of prints with great results and no need for solid “breathing ” fabrics in between. One of my favorite projects is the cover quilt–where Susan shows us that how to rotate one simple block to create a striking cross design. 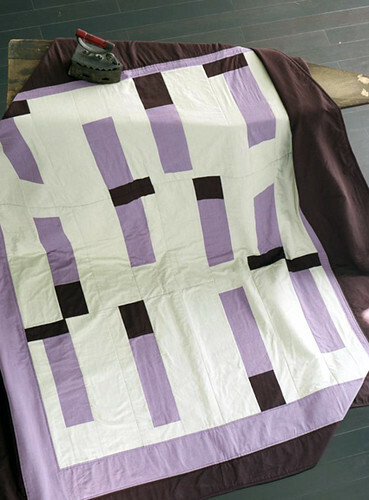 I would never have guessed that the Northwest Modern Quilt (above), contributed by Daniela Cane, was made from log cabin blocks, but a crystal-clear layout diagram makes it easy to see just how those simple blocks form this seemingly random design. 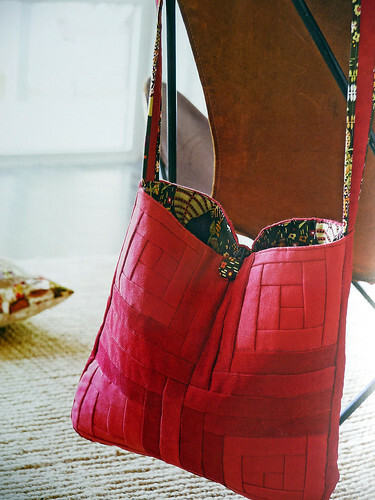 I also love the textural play of the Red Cross Bag, which employs both sides of corduroy fabric, producing an almost woven effect. 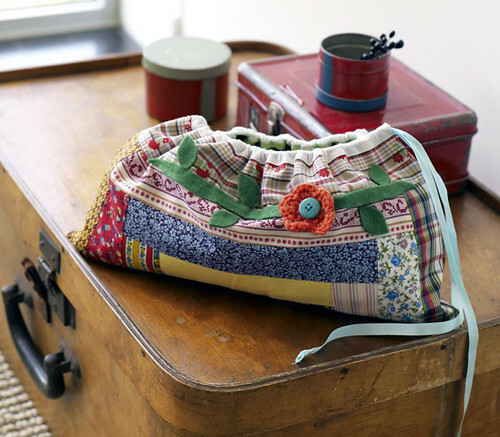 This is a project that makes me want to sit at my sewing machine again! And I was touched to see that Susan saved the first crochet flower she made (which I walked her through when I was in Portland) as a finishing touch for the Drawstring Bag. You know me, I never think you have to stop at just one crafty skill! And just so you can see how easy this technique is, Susan has created a tutorial which you can view above or by clicking here. Be sure not to miss Modern Log Cabin Quilting, it will refresh your mind with new ideas for quilts. I just love that you can get so many results from the same style of block. And if you have a fabric stash that could use some spring cleaning, check out Susan’s new quilt project, Quilts For Quake Survivors. Full Disclosure: Potter Craft sent me a review copy of the book, book links are affiliate links. Thank you SO much, Linda! I really appreciate your kind words and thoughtful review. So happy that you like those projects - they're some of my favorites too! Daniela's quilt is just remarkable. Can't believe it's the first one she ever made. Thanks for the beautiful book, Susan! This book excites me because I love log cabins but they can look "old"
Super big fan of log cabins! Thanks for the review! You're most welcome. The log cabin is my favorite block to piece.